Home > Logos > The Halloween Witch Google Doodle : Spooky But Offensive? 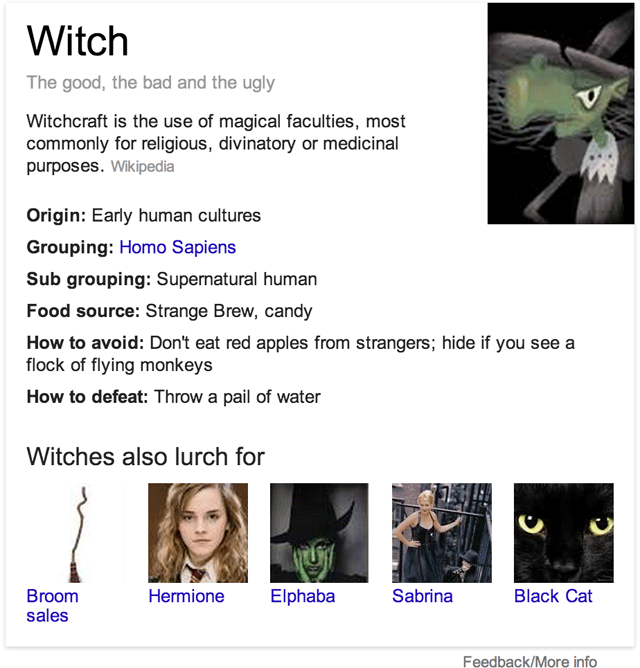 The Halloween Witch Google Doodle : Spooky But Offensive? Today on Google's home page is the 2013 interactive Google Logo, aka Google Doodle. This is the Halloween Witch, which lets you mix and match potions into a cauldron and then see the output. While the logo is fun and spooky, some are calling it offensive and insensitive. However, one person posted in the Google Web Search Help forums telling Google the logo is offensive and insensitive. This person explained, "the depiction of the witch as an old, ugly evil woman derives from Christianity and is quite frankly offensive to modern witches in Wiccanism and other neo-pagan movements." You can find more Halloween Google knowledge graph easter eggs over here.